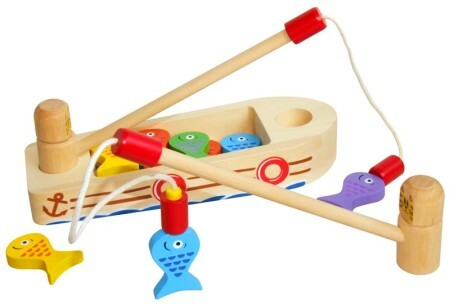 The set comes with a wooden boat, two easy to grasp rods and ten coloured fish. The two fishing rods, complete with cheeky cat faces, fit into the bow and stern of the boat and can be turned to trawl for the fish. You can then put the fish in the boats cargo hold. A lovely little toy which can be played with by two children to see who can catch the most fish. The magnets on this toy are set inside the fishes body so there are no small parts to dislodge. Material: Wood with Child Safe Paint, Magnets, Cotton String. We like this because: " Well thought out toy, beautifully smooth, very pretty fish. Great for those fishing adventures"